What Are The Most Cost Effective Roofing Materials? The subject of roofing materials in general terms; is usually considered when a home or business owner is faced with the proposition of having to replace their roof. The key when investing in a roof replacement is selecting the best quality roofing materials and selecting the best contractor for completing a particular type of roofing project. Certified Contractor’s Network™ is a contractor education-based organization, which helps their contractor members throughout Canada, and the United States; with training on the subject of running a quality driven construction business. In teaching their contractor education process; they discuss the fact that good roofing materials, plus a bad contractor; equal a bad construction investment for the consumer. Similarly selecting a good roofing contractor, but selecting lower quality roofing materials; also can result in a poor construction investment. So while often overlooked, the selection of superior roofing materials, should be paramount when electing to complete a new or re-roofing project. So what determines quality in roofing materials? That depends on specifically what purpose the roofing material is designed for; and what the time period the product manufacturer warrants the roofing materials for. Manufacturers can claim all kinds of warranties, but if a roofing material fails prematurely, terms of the manufacturer’s warranty can become very important, in helping to cover the project replacement costs if necessary. The other key components when selecting superior roofing materials involves the raw materials used in the product, and the consistency of the manufacturing process, as well as the quality control procedures utilized during the manufacturing process. The fact is, roofing contractors and home /property owners alike; have little to no control over how well a roofing material is actually manufactured. What they can control is exercising due diligence in researching the particular manufacturer, seeking third-party product validation such as Good House Keeping™ seal of approval, UL testing certification, ASTM testing certification, and checking Consumer Reports. Quality driven contractors typically invest in higher quality roofing materials; much like a quality mechanic will use parts from the car manufacturer, as opposed to cheaper replicated parts. Conversely, the contractor who tries to win business based on low price usually seeks out the least expensive brand options as their sales offering. One only has to check the internet in recent years, where discussion and blogs relating to class action lawsuits levied against particular shingle manufacturers; highlights the discussion points noted above. Failures which resulted in products that lasted only forty percent of their promoted twenty-five year lifespan. This not only resulted in consumers having to handle the expense of replacing their roofs prematurely, but the events damaged customer relations between contractors and their clients. Many consumers blamed the contractor for selling them a poor choice of roofing materials. Although the cost of the class action lawsuits was in the scores of millions; the damaged reputation and customer dissatisfaction resulted in many more millions of lost business and reputation to the contractors affected by the poorly manufactured roofing materials. While there are literally thousands of roofing materials on the market worldwide; below are the most common roofing materials used in North America. Roofing materials can be divided into several categories, but for simplicity; once can think of roofing materials in two ways. Roofing materials which are natural or organic in nature; and materials which are typically some form of derivative of the petroleum industry. Many roofing materials which are considered “natural” products can provide certain advantages such as longevity and durability. One example of such as product slate. Advantages of using these types of materials can involve little or no off gassing, increased fire resistance, and lower cost life-cycle over time. Usually, these products are completely recyclable, such as copper for instance. It is also important to note that certain asphalt based roofing materials may also be recycled like TPO. Particular roofing materials described are designed for specific roofing applications. Products like hot asphalt, organic or fibreglass felt, and modified bitumen is used for flat roofing applications. 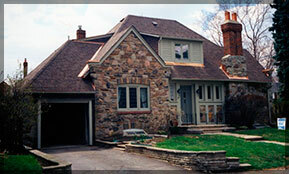 Roofing materials such as shingles, slate, cedar and metal are utilized in steeply sloped roof assemblies. The best roofing materials are products which have a demonstrated history of performance over many decades if not centuries. Slate as an example has been used on buildings in Europe for over 500 years. It is common for a slate roof to last one hundred years in North America, as evidenced in most large cities in the Eastern United States and Canada. By comparison, asphalt or fibreglass shingles have a lower initial cost point, versus products like slate or metal roofing; but also have a life-cycle commonly one third or less, of the natural rival products. When considering flat roofing, and particularly when investing in the roof replacement on large commercial assets; products like TPO membranes can be more cost-effective over time, lighter weight and more energy efficient, when compared to built up asphalt roof systems or modified bitumen, which have a 15-25 year typical life-cycle. 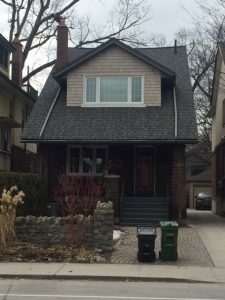 When discussing the subject of roof shingles, which cover most residential homes in North America; they are popular because they are relatively easy to install for n experienced roofing contractor, and affordable for most homeowners, in comparison to some of the natural steep slope options. Today’s roof shingle market is dominated by fibreglass laminate type shingles. These represent an evolution from a generation ago, when organic asphalt (three tabs), asphalt paper shingles were the norm. Advantages of the fibreglass shingles include that they are typically more impact resistant, have no slots in their design which permit driven rain or ice to creep beneath preceding layers, and have a higher concentration of asphalt in their design. Eliminating paper ply layers in favour of a woven fibreglass mat; helps prevent curling of the shingles as they age. 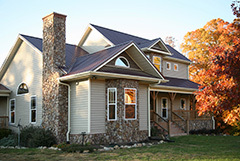 Manufacturers promote their shingle products by warranty period typically. When a manufacturer says the shingle is a limited lifetime shingle as an example; this is where the consumer must examine the fine print so to speak. Although some shingle manufacturers claim to be better than their counter-parts, and indeed many shingles look similar in appearance between manufacturers; the true story can be told in the warranty documents and specifications available for review. This is the most overlooked information by the consumer, and by many contractors. That one of the manufacturers does not publish the weight of their shingles. That one manufacturer only covers the warranty if specifically leaking results from product failure, but does not cover appearance issues, even if the product looks prematurely degraded. Certain manufacturers only warranty their products if they are installed by the manufacturer’s certified installer. The Latin saying: “caviate emptor” (Let the buyer beware), certainly applies when reviewing today’s roof shingle warranties. A two or three dollar per bundle difference in cost may be negligible at the time of initial installation when compared to having to try and enforce a roof warranty nine years later. Choosing the right contractor is, of course, an equally important decision, as is the quality of roofing materials to be used for the project. We will discuss this in point in future articles. With over four decades of experience in roofing, AVENUE ROAD ROOFING® would be the leading choice for homeowners and commercial owners. To learn more about correct job specifications, and or superior value, product selections; contact us today at 416-785-5129 or contact us to request a no-obligation consultation.